This post contains affiliate links. If you purchase something from these links, About a Mom receives a small commission. 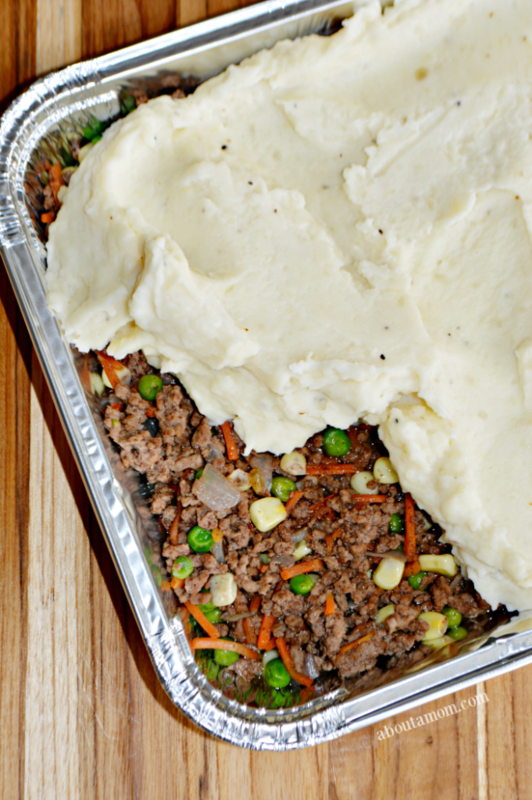 This freezer-friendly Shepherd’s Pie recipe is affordable and easy-to-prepare. It’s a great make-ahead freezer meal that the whole family will enjoy. You seriously can’t go wrong with this easy meat and potatoes dish. I have come to rely so heavily on Freezer Meals. A couple of weeks ago my sister came over on a Sunday afternoon, and we made a bunch of freezer-friendly meals for our families. It is so nice to have them on hand during the busy week. Related: Check out these 5 Healthy Slow Cooker Freezer Meals. You might also like this Freezer Lasagna recipe or my Baked Spaghetti Freezer Meal. For this shepherd’s pie, I used my favorite freezer mashed potatoes. The link to that recipe is in the ingredient list below. It makes a little more mashed potatoes than you’ll need for this recipe, but I love having the leftovers for later in the week. The recipe is enough for 1 9×13 baking dish or 2 8×8 square foil pans. The 8×8 pans will easily feed 4 people. Pro Tip: If you are using your regular baking pans, line the pans with this pan liner. It makes clean up much easier. I prefer to use disposable pans. That way I do not have to worry about clean up or not having one of my pans available when I want it. Meanwhile, heat a large frying pan over medium heat. Add the olive oil and onions. Cook for 2-3 minutes until onions start to become translucent. Add the carrots, cooking for an additional 5 minutes. Add the ground beef and cook until no longer pink. Drain off any excess fat. Add the worcestershire sauce, salt and allspice seasoning into the cooked meat mixture and stir until incorporated. Sprinkle flour over the top of the mixture and pour in the beef stock. Stir together and allow sauce to bubble and thicken some. Once the sauce has thicken add the frozen vegetables. Give it a quick stir to combine and remove from the heat. Spread the meat mixture out evenly along the bottom of a 9×13 or 2 8×8 casserole dishes or foil pans. Spoon the mashed potatoes over top of the meat. Use enough of the mashed potatoes to make about 1/2 inch layer on top of the meat. Cook in the oven at 350 degrees F until heated through and the potatoes are golden brown on top, about 20 to 25 minutes. Or, prepare for the freezer by wrapping in aluminum foil and plastic wrap. Store in the freezer for up to one month. Defrost overnight in the refrigerator before baking. Tip: Save yourself some time by using pre-shredded carrots. I always have a bag on hand for salads, and it works perfectly in this recipe. Tip: Make this dish extra special by sprinkling with 1 cup shredded Cheddar cheese before baking. This freezer-friendly Shepherd's Pie recipe is affordable and easy-to-prepare. It's a great make-ahead freezer meal that the whole family will enjoy. You seriously can't go wrong with this easy meat and potatoes dish. Spread the meat mixture out evenly along the bottom of a 9x13 or 2 8x8 casserole dishes or foil pans. Spoon the mashed potatoes over top of the meat. Use enough of the mashed potatoes to make about 1/2 inch layer on top of the meat. « SING is now available on Digital HD + A Fun Microphone Craft for Kids! I can’t remember the last time I had Shepard;s Pie. That looks delicious! My family loves Shepherd’s Pie. I would love to try this great recipe out. Can you believe I have never had Shepherds Pie before? Looks amazing. Thanks for the recipe! I have never tried making this but think i’m finally going to give it a try! I am 54 and have never eaten Shepard’s Pie before. I love freezer meals, for days I have no energy for cooking and then we don’t have to get take out! This would be awesome for my daughter. Our family’s space adventure would be to visit each planet to see what it’s like! I can’t wait to try this! Looks delicious! I have never tried Sheperds Pie before. But it looks amazing and think I will try it. How long would you reheat in a microwave? Hi Alma! It would be a total guess as I have never reheated this in the microwave. I would recommend 1 minute increments until it is heated through. My hubby and I both love Shepherd’s Pie. I would love to have this in freezer for easy home cooked meal. This looks like an awesome Shepherd’s Pie. Approximately how much is two carrots if I’m using preshredded carrots? I would go with 1 cup, shredded. Thanks for asking. I’ll need to update the recipe. How long and at what temp do you heat in the oven after it’s been frozen and thawed? I love Shepard;s Pie.and making it ahead and freezing it would be a good time saver for the evenings that I can’t cook. I’ve never made anything like this before. Looks delicious! I’m always looking for something new to try!